In addition to melting icecaps and imperiled wildlife, a significant concern among scientists is that higher Arctic temperatures brought about by climate change could result in the release of massive amounts of carbon locked in the region’s frozen soil in the form of carbon dioxide and methane. Arctic permafrost is estimated to contain about a trillion tons of carbon, which would potentially accelerate global warming. Carbon emissions in the form of methane have been of particular concern because on a 100-year scale methane is about 25-times more potent than carbon dioxide at trapping heat. However, new research led by Princeton University researchers and published in The ISME Journal in August suggests that, thanks to methane-hungry bacteria, the majority of Arctic soil might actually be able to absorb methane from the atmosphere rather than release it. Furthermore, that ability seems to become greater as temperatures rise. The researchers found that Arctic soils containing low carbon content — which make up 87 percent of the soil in permafrost regions globally — not only remove methane from the atmosphere, but also become more efficient as temperatures increase. During a three-year period, a carbon-poor site on Axel Heiberg Island in Canada’s Arctic region consistently took up more methane as the ground temperature rose from 0 to 18 degrees Celsius (32 to 64.4 degrees Fahrenheit). The researchers project that should Arctic temperatures rise by 5 to 15 degrees Celsius over the next 100 years, the methane-absorbing capacity of “carbon-poor” soil could increase by five to 30 times. The researchers found that this ability stems from an as-yet unknown species of bacteria in carbon-poor Arctic soil that consume methane in the atmosphere. 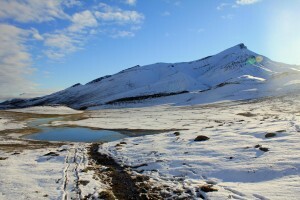 The bacteria are related to a bacterial group known as Upland Soil Cluster Alpha, the dominant methane-consuming bacteria in carbon-poor Arctic soil. The bacteria the researchers studied remove the carbon from methane to produce methanol, a simple alcohol the bacteria process immediately. The carbon is used for growth or respiration, meaning that it either remains in bacterial cells or is released as carbon dioxide. First author Chui Yim “Maggie” Lau, an associate research scholar in Princeton’s Department of Geosciences, said that although it’s too early to claim that the entire Arctic will be a massive methane “sink” in a warmer world, the study’s results do suggest that the Arctic could help mitigate the warming effect that would be caused by a rising amount of methane in the atmosphere. In immediate terms, climate models that project conditions on a warmer Earth could use this study to more accurately calculate the future methane content of the atmosphere, Lau said. The researchers want to study the bacteria’s physiology as well as test the upper temperature threshold and methane concentrations at which they can still efficiently process methane, Lau said. Field observations showed that the bacteria are still effective up to 18 degrees Celsius (64.4 degrees Fahrenheit) and can remove methane down to one-quarter of the methane level in the atmosphere, which is around 0.5 parts-per-million. From Princeton, Lau worked with geoscience graduate student and second author Brandon Stackhouse; Nicholas Burton, who received his bachelor’s degree in geosciences in 2013; David Medvigy, an assistant professor of geosciences; and senior author Tullis Onstott, a professor of geosciences. Co-authors on the paper were from the University of Tennessee-Knoxville; the Oak Ridge National Laboratory; McGill University; Laurentian University in Canada; and the University of Texas at Austin. M.C.Y. Lau, B.T. Stackhouse, A.C. Layton, A. Chauhan, T. A. Vishnivetskaya, K. Chourey, J. Ronholm, N.C.S. Mykytczuk, P.C. Bennett, G. Lamarche-Gagnon, N. Burton, W.H. Pollard, C.R. Omelon, D.M. Medvigy, R.L. Hettich, S.M. Pfiffner, L.G. Whyte, and T.C. Onstott. 2015. An active atmospheric methane sink in high Arctic mineral cryosols. The ISME Journal. Article published in print August 2015. DOI:10.1038/ismej.2015.13.